Unless you count the odd batch of Jell-O growing up, I haven’t done much cooking with gelatine. It’s not that I have anything against the substance or the wobbly forms created by it; I just have not been drawn to recipes that call for it. That is until I came across a recipe for vanilla yogurt panna cottas in a recent issue of Delicious. The recipe called for some of my favorites: Greek yogurt and vanilla bean paste (truth be told it calls for real deal vanilla beans, but I knew the paste would work great) and if it meant I would have to run out for a rather unfamiliar ingredient – gelatine, that would make it all the more fun of an experiment. This dessert was easy to make and turned out perfectly. In fact, the most challenging task was finding a good mold for the panna cottas. After a trip to Sur la Table and a number of internet searches turned up nothing, I ended up with a silicone muffin tin that provided the flat bottom and slightly rounded sides I was looking for. This turned out to be less than ideal for unmolding the desserts since I couldn’t unmold each one individually. If you can track down shallow, individual molds with the rounded sides and flat bottom, by all means use them and please tell me where you found them! Since these desserts are so simple and use ingredients that I almost always have on hand (even gelatine now that I’ve stocked up on envelopes), they would make a great last minute end to a fabulous meal if it weren’t for their necessary four hour chilling time. Be sure to start these early in the day so you have ample time for them to set. Now that I’ve had success with gelatine and gotten to enjoy the slightly firm little wobbly desserts that it can create, I think I’m hooked. After all, it really is one of the earliest forms of molecular gastronomy. Don’t you think? Dissolve the gelatine in 1/4 cup of the milk. Place the remaining milk, cream, sugar and vanilla in a medium sauce pan and bring to a simmer. Remove the pan from the heat and stir in the milk with the dissolved gelatine. Strain the mixture through a fine mesh sieve and cool to room temperature. Whisk in the yogurt. Divide the mixture between your 6 molds (or more if you have additional liquid) and chill for at least four hours. Dip the molds in hot water briefly before unmolding to help the panna cotta slip out. Serve with fresh fruit. Very pretty dessert! I love greek yogurt so I'm sure I'd enjoy this. Hope your week is treating you well! Very lovely!!! This looks perfect for after dinner tonight!! What a gorgeous picture! I actually really like desserts than can be made well in advance, so that way you are done cooking once dinner is on the table. Like the sound of pannacotta made with yoghurt, am guessing a little lighter than full on double cream! What a lovely photo. I'd never thought about making panna cotta with yogurt. Have you tried those little silicone cupcake cups? I imagine they'd leave a fluted edge, but that's not bad. What I love about panna cotta is that it's such a great blank canvas. You could flavor it with anything! I think I have to make this. For no reason other than I really want to do something that can be called, "molecular gastronomy." Very elegant! 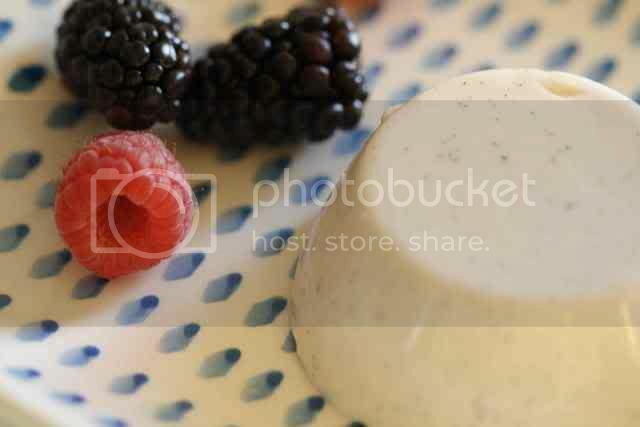 We love panna cotta around our house, especially with fresh berries. Just love the photo. I am a hugh panna cotta junkie but have never made it myself. I'll have to give this one a try for my next dinner party.